Protestors rallied Sunday at the downtown Philadelphia Starbucks where two black men were led out in handcuffs by police and accused of trespassing to decry the actions of the coffee company and the cops. 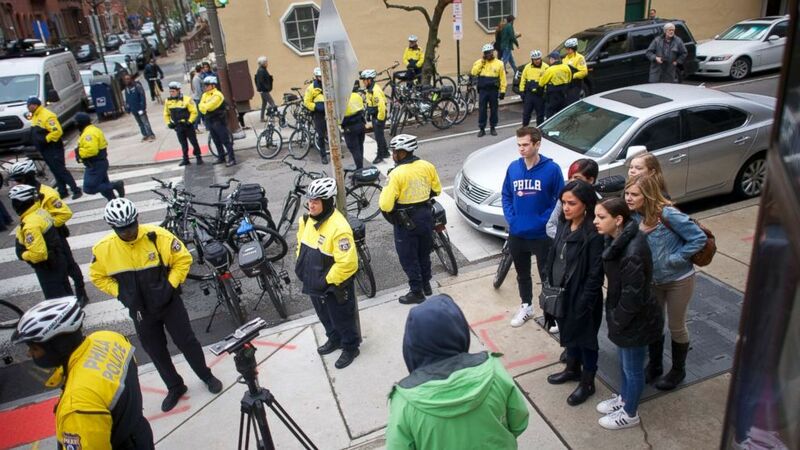 Armed with bullhorns and signs, a small group of protestors gathered outside the Starbucks on Spruce Street and demanded action in the wake of Thursday's arrests. They directed their rage at Starbucks, the police department and the workers who called the cops in the first place. "We want the manager fired form this establishment for racially profiling black people," a man boomed from the bullhorn. "We want the police officers in the arrest fired as well." The protester with the bullhorn said the activists were "not going anywhere" and vowed, "We're going to show you want a shutdown means." The arrests of the men -- who have not been identified, but have retained an attorney -- was captured on video and tweeted by Melissa DePino, a 50-year-old mother of two who told ABC News she's vowed to not shop at Starbucks again. It's since been viewed more than 9 million times as of Sunday afternoon. "It was humiliating for those guys," Depino told ABC News. "They were completely minding their own business." (Mark Makela/Getty Images) A group of people observe protesters demonstrating outside a Center City Starbucks on April 15, 2018 in Philadelphia, Pennsylvania. Both men were later freed and the charges they were facing -- trespassing and disturbance -- were dropped Thursday night. This happened while paperwork was being drawn up. District Attorney Larry Krasner also refused to prosecute once Starbucks asked to not press charges, according to a video testimonial released by Philadelphia Police Commissioner Richard Ross Jr. on Saturday. Attempting to deflect blame away from his department, the commissioner assured the public that he has reviewed the facts and defended the cops, saying they "did absolutely nothing wrong." Ross also accused the men of being disrespectful to the officers who were summoned to the Starbucks and said that both were given several chances to leave, but they kept refusing. (Mark Makela/Getty Images) Michelle Brown, 50, left, demonstrates outside a Center City Starbucks, April 15, 2018 in Philadelphia. Police arrested two black men who were waiting inside the Center City Starbucks which prompted an apology from the company's CEO. Starbuck's chief executive officer, Kevin Johnson, apologized to the two men on behalf of the company. He said he intends to come to Philadelphia to meet with them to "offer a face-to-face apology." "The video shot by customers is very hard to watch and the actions in it are not representative of our Starbucks mission and values," Johnson said in his statement released late Saturday. "Creating an environment that is both safe and welcoming for everyone is paramount for every store. Regretfully, our practices and training led to a bad outcome -- the basis for the call to the Philadelphia police department was wrong. Our store manager never intended for these men to be arrested and this should never have escalated as it did." (Mark Makela/Getty Images) Starbucks Mid-Atlantic Regional Vice President Camille Hymes addresses protesters and media in a Center City Starbucks on April 15, 2018 in Philadelphia, Pennsylvania. Hymes also expressed regret that the men were mistreated. 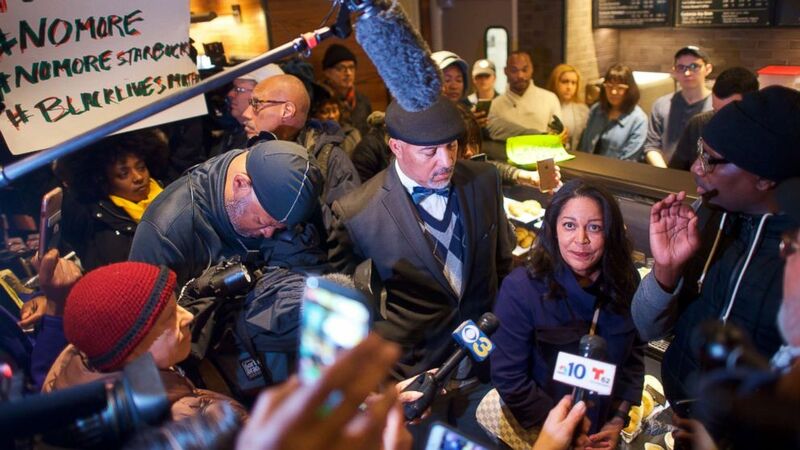 Still, Mayor Jim Kenney came down on Starbucks for the incident, saying it "appears to exemplify what racial discrimination looks like in 2018." Meanwhile, protestors called for the police department to be held accountable. One protester, who claimed to be a former police officer, questioned the way the authorities treated the two black men. (Mark Makela/Getty Images) People demonstrate inside a Center City Starbucks, April 15, 2018 in Philadelphia. Police arrested two black men who were waiting inside the Center City Starbucks which prompted an apology from the company's CEO. "The police officers should have raised a question to the manager and asked, 'Why was this situation indicative of a phone call to the police?'" he said. "There were witnesses in the store to corroborate there was no incident to cause a need for the police to come." 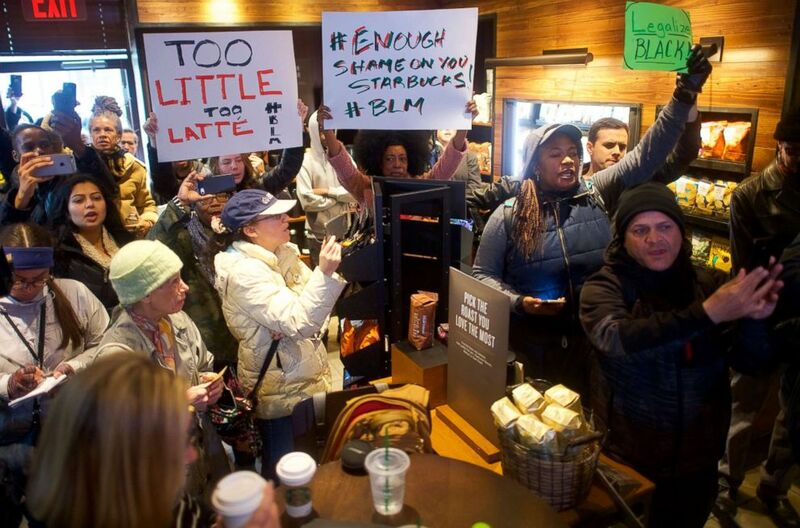 Black protesters said the arrests -- which onlookers at the time suggested may have been racially motivated -- made them question whether to keep going to Starbucks. "I'm a Starbucks rewards member and I'm black too!" read a sign held by a black woman. "This is 2018, there shouldn't be any racism going on," she said. "We should not be going through this." 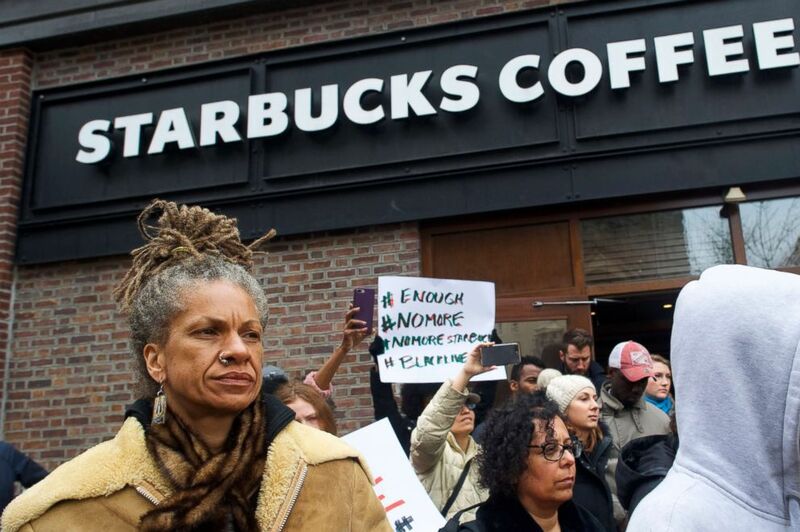 White protestors, too, said Starbucks' apologies fell flat. (Mark Makela/Getty Images) Pictured (L-R), mother and step-daughter, Donn T and Soren Mcclay demonstrate outside a Center City Starbucks, April 15, 2018 in Philadelphia. 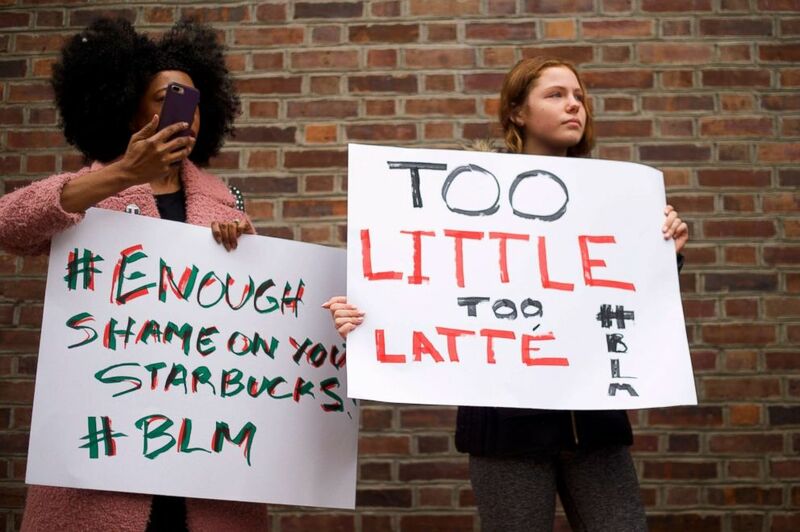 "Too Little Too Latte" read one young, white woman's sign who showed up to the rally. Another protestor said that if the two men could be arrested at a Starbucks without purchasing anything -- a common practice at the popular coffee company's franchises -- it could happen to anyone. "It could very have been my son, my dad," one woman said. "We should be able to go in equally and sit equally."